Netflix's ongoing VPN crackdown is meeting fierce resistance from concerned users around the world. 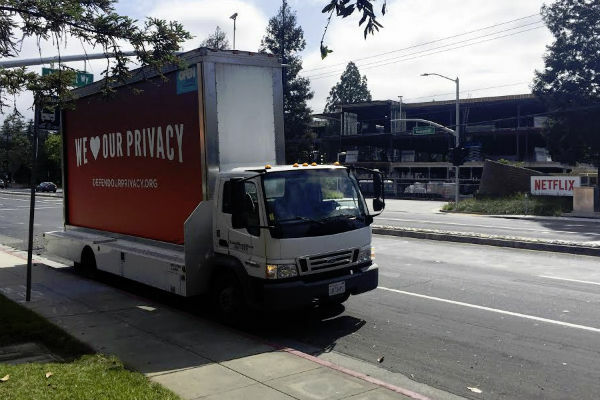 Today, privacy activists are driving a massive billboard around Netflix's headquarters, hoping the company will respect their privacy and reverse the broad VPN ban. In an effort to appease Hollywood’s major studios, Netflix increased its efforts to block customers who circumvent geo-blockades this year. As a result it has become harder to use VPN services to access Netflix content from other countries. However, the measures also affect well-intentioned customers who merely use a VPN to protect their privacy. This broad blocking policy has sparked wide protests and tens of thousands Internet users have signed a petition launched by digital rights group OpenMedia, which asks Netflix to stop the VPN crackdown. A few weeks ago OpenMedia sent an open letter to Netflix, inviting CEO Reed Hastings to discuss possible alternatives. In absence of a reply, the group is now following up with a new message that’s unmissable. This week a massive mobile billboard is driving through the streets of Los Gatos, California, where Netflix headquarters are located. The billboard carries the message “We ♥ Our Privacy,” with the URL of the VPN unblocking campaign. OpenMedia hopes that the billboard will send a clear message. The protests are not going to stop and with thousands of new signers per week the campaign is gaining momentum. “Right now, Netflix customers are being forced to choose between watching their favorite shows and safeguarding their privacy,” OpenMedia’s digital rights specialist Laura Tribe says. OpenMedia understands that Netflix has to comply with Hollywood’s demands to restrict access, but it believes that there a there are better ways to make sure that geographic restrictions are enforced. For example, by simply linking content libraries to credit card addresses.